Another fun, exciting, informative, delightful (have I used enough superlatives yet?) BATS has come and gone. Wow. Thank you, Thalassa! There was so much to do and so many people to see. There was an extensive collection of workshops, but that’s just one attraction. Spending time with your tribe and (for me, at least) networking with others in my profession are, perhaps, even bigger attractions. My only complaint, then, is that there’s never enough time to talk to everyone I want to, and with the triple presentation track, it’s impossible to go to every workshop I wanted to see. (Sometimes I couldn’t even just flip a coin since all three were “must-see” workshops.) But I did get to have a few great discussions with some wonderful people, and I did get to go to some exciting and informative workshops. So I thought I’d say a bit about this great event. It all started with a drive up to San Jose with a couple of friends. (The trip always goes so much faster if you have good friends to talk to!) We arrived in time for a quick bite to eat and some fun chatting with the many people already there who were hanging out at the bar. Now, mind you, the event officially starts on Saturday, but we Tarot peeps are party animals (no, really! ), and there was a party going on that evening in Marc Perry’s room. There were lots of people, wine, and fun … until it was busted up by Hotel security. (Okay, that sounds way more dramatic than it was.) So Davida Rappaport and I headed off to have our own little tête-à-tête. We had a great conversation about the Tarot biz, and we swapped readings. (It’s always quite interesting to get a reading from a fellow Tarot professional to see how other people do it. Tarot reading techniques are like snowflakes, it turns out – no two are alike.) I’ll just share one salient piece of advice from our conversation regarding a Tarot business: Set an intention for the kind of business you want and the kinds of success you want with it! Yes, that sounds simple, but it’s really powerful. A typical beginning for a BATS experience is to draw a Tarot card from the cauldron full of cards at the entrance to the event. I drew the Beast of Wands from the Tarot of the Crone by Ellen Lorenzi-Prince. (Note that in this deck, the Beast corresponds to the Page or Princess.) This said to me that this event would bring me back to the enthusiasm for Tarot that I had at the beginning of my journey. It’s inevitable that as the years go on, the enthusiasm of our novice years sometimes wanes, but participation in events like this always bring back that fun and excitement of a beginner. And, indeed, so it did for me. So this was a great card for me to pick, and it’s an apt card to characterize one of the benefits of attending a Tarot event like this. The first workshop I attended (and boy, was it hard to choose just one!) was “Tell me a Story,” presented by Pamela Steele. Pamela described to us a wonderful way to use the cards to create a story which seemed sort of like a more complex and structured version of “The Tarot Story” game. And then we had a great deal of fun using it! The intention of this workshop was “to help sharpen and polish your skills as a Tarot reader using story-telling to enhance your delivery.” However, I can see this as a fun way to use the cards in a party setting too, and if you write fiction, it should be a very useful tool there as well. Next up: Renna Shesso’s workshop on astrological associations in the Tarot. She presented a variety of association schemas, each of which had its own unique features. (Who knew there were so very many? I have a hard enough time keeping up with just one!) But here’s the most fun fact I discovered in this talk. Do you know why there are two dogs on the Moon card? Here’s a possibility: In some traditions, this card is associated with the sign of Cancer, and Canis Major and Canis Minor (Greater Dog and Lesser Dog) are constellations close to Cancer. After lunch I went to Pamela Eakins’s workshop, “Tarot and Soul Retrieval.” Pamela is the creator of the Tarot of the Spirit deck, which is the deck we used in an exercise in this workshop. In that exercise, we each pulled a card from her deck to see what blocks in our lives are holding us back. Then we did a guided visualization with that card to see what can release that block. (To facilitate the process, Pamela accompanied our visualization journeys with a drum beat.) The card I got (the Father of Fire) was very appropriate and the visualization I did was rather effective, which was surprising given the constraints of doing this in a workshop. The final Saturday presentation that I went to was “Tarot Divination and Chinese Fortune-Telling Theory.” In this workshop, Benebel Wen noted some interesting comparisons between the two systems. One thing that stuck out for me was a way to get Yes/No answers to questions. I have seen several variations on this theme in Tarot. The most common (from my research) is to use a deck in which the cards have been shuffled to give both upright and reversed cards. Then you deal two cards and interpret the Yes/No answer based on the relative orientation of them. The way to interpret the answer is both similar and different than what one would expect from considering the Jiao Bei system. In this case, your answer would be yes if both cards are upright, no if both are reversed, and maybe / indeterminate if one is upright and the other reversed. I found it remarkable how similar these two methods are, considering they don’t have a common origin at all. (One might expect Yes/No questions to be answered by just a one card draw: Upright = Yes and Reversed = No.) But the difference between the two is also remarkable, and it could indicate an interesting insight into Eastern vs. Western culture. (Forgive me for this quick tangent.) Western culture sees value judgments in dichotomies, so when one thing is good (Upright), the opposite is bad (Reversed). Hence, a Yes answer comes from two upright cards and No comes from two reversed ones. In Eastern culture, however, neither Yin nor Yang is “good” or “bad.” It’s a balance. So there, a Yes answer comes from that balance of one moon block round side up and the other flat side up. Both of the other answers, No and Indeterminate, come from both blocks being in the same orientation (i.e., out of balance). Okay. So that was it for the presentations on Saturday… but not the end of the fun! (Remember, we Tarot peeps are party animals.) Saturday night brought the Magical Mystical Mixer! First, however, I went out to dinner with the inimitable Joseph Martin and a couple other of our friends. It’s informal little gatherings like this that add a special something to a Tarot conference, and the chance to catch up with Joseph (who I’d not seen in a few years) was no exception. The Magical Mystical Mixer also provided a chance to schmooze and network, but in a costumey sort of way. Of course, you don’t have to dress up (Me? I’m too darn lazy for that), but honestly, you’ll never see so many bustiers, corsets, and flashy clothes (not to mention the bling!) in one place. I’ll just show you a couple of pictures to demonstrate the fact that you can dress up to the Nines (as you can see with the lovely Mademoiselles Katrina Wynne and Rana George) or not (as I so deftly demonstrate). The dawn of the final day of the conference is always a bit bittersweet since I know that I’ll be leaving all these great people and events at the end of the day. On the other hand, I know there’s lots of great stuff still coming up that day. In addition, my presentation was scheduled at the final slot of the program, so there was that to look forward to. PS: If you’re interested in some of Mary Greer’s thoughts on Jung and Tarot and you missed this workshop, you can read her blog post from a few years ago titled (appropriately) Carl Jung and Tarot. Right after lunch, when post-meal drowsiness sometimes sets in, I went to James Wanless’s workshop titled “Out of the closet: the Tarot revolution.” First, let me say that putting James Wanless right after lunch was a stroke of genius on Thalassa’s part because he is one person who is guaranteed to keep you awake! In fact, no matter what his workshop is about, I always know it’ll be exciting and inspiring. We also did a couple of exercises. James had us pull a card to see who or what we want to be in our Tarot practice, and then we paired up and discussed what that card said with a partner in the class. He also asked us to think of someone who epitomized a revolutionary spirit, and then do a quick visualization with that person to get advice about how to revolutionize our Tarot work. That was a good one! I chose Che Guevara, and he urged me to be more courageous in speaking my truth and asserting who I am and what I do with my Tarot practice. The power of the Tarot is in the element of surprise, for we remember the things that surprise us. Every “negative” card is an opportunity. That second one provides an especially great perspective. In fact, if that were the only thing that a Tarot reader got from this workshop, it would be enough. Finally, the moral of the story is this: Next year, do consider going to BATS, or some other Tarot conference! (Here are a couple other annual events worth attending: The New York Readers Studio and the Northwest Tarot Symposium) You won’t regret it. 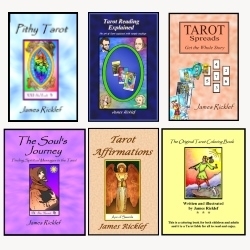 And if you need even more convincing, you can read my reports on past Tarot conferences here. PS: In case you’re wondering, I did do a few readings while I was there. They went very well, but naturally, discretion keeps me from saying more. The shot of Thalassa is courtesy of McCord. I think the one of Benebell is too, but I’m not sure. The shot of Mary Greer is courtesy of Davida Rappaport. Rana herself took our picture and the one of Katrina and me is courtesy of Jeffrey Elliott. I don’t know who did the shot of James Wanless. If anyone knows, please let me know. This BATS Report is, by no means, comprehensive of all I got to see and do, the content of the workshops, and everyone I got to meet and talk to. What a wonderful article! This was my first tarot convention but it definitely won’t be my last. The energy of being around so many amazing people was so palpable and exciting! It was nice to read about the classes that I didn’t attend, now I can see why we didn’t have as much of a chance to meet, I picked completely different presentations! I did attend Benenbell Wen’s and it was as informative and interesting as I had expected. I actually have a pair of those divination moon blocks and I was happy to learn how to properly use them. I had to leave earlier on Sunday than I had anticipated but I had already gained so more more than I ever hoped. This community, this tribe, is like no other and the chance to interact with and get to know these inspiring, fun, loving individuals was a truly priceless experience. Wow! You’ve been to almost all of them! Glad this report gave you some measure of feeling like you were there. That’s a large part of my intent with it. Too bad we can’t go to all three tracks of the workshops! This was a fantastic weekend and I’m so happy to have your post so I can relive it a bit.